"The activity 'Ab in die Mitte!' 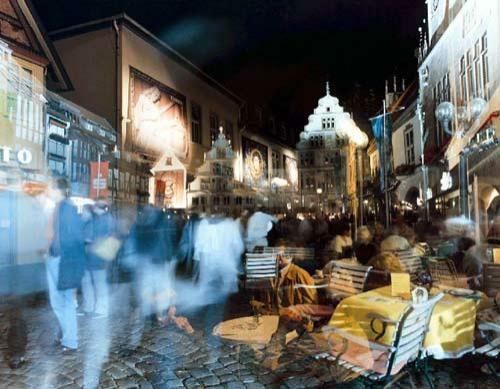 shows that public and private measures increase the attraction of city centres. The government of North Rhine-Westphalia likes to support this type of campaign." • Let's liven up the cities! • And, thus, attract more visitors! Development and implementation of town and city marketing projects. • An expert survey on the current role of leisure time showed a rising demand for a better quality of life and more leisure time, indicating the growing importance of recreational values. • The local recreational values are comprised of a set of different factors, e.g. culture, restaurants, the traffic situation, shopping facilities, societies and clubs, sports and entertainment. These trends have been considered in the 'Ab in die Mitte!' project. A network was created combining public cultural events, sports, leisure and other activities with the city centres as 'growth' centres of retail trade, services and culture. Retailers are aware of their responsibility for their town. The major department stores, Karstadt and Kaufhof as important sponsors on the part of the retail trade, have entered into a 'private public partnership' with the government of North Rhine-Westphalia and 10 cities. 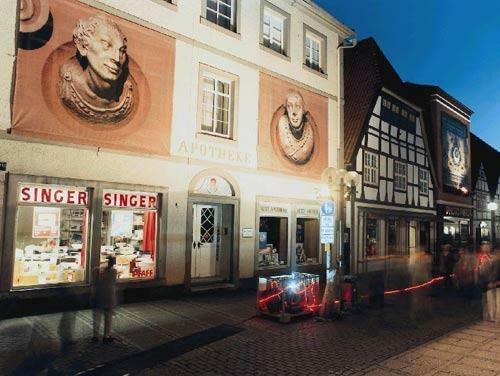 In 2000 initiators next to the above-mentioned partners were the Douglas Holding AG, Bild NRW, the Work Team and the Association for retail trade in NRW and the convention of municipal authorities. These initiators support over a period of 3 years different cities and their music, theatre, lights projects and many more, with more than 7 million e.
The 'Ab in die Mitte!' initiative was an experiment to organise concentrated and special events on the basis of a new partnership. With this joint project a first step is taken to make town and city centres in North Rhine-Westphalia more attractive. Aachen, Ahlen, Bad Laasphe, Bad Oeynhausen, Bergkamen, Bielefeld, Bocholt, Bochum, Bonn, Brühl, Detmold, Dortmund, Düsseldorf, Duisburg, Essen, Gelsenkirchen, Gütersloh, Hagen, Hamm, Herne, Herzogenrath, Horstmar, Iserlohn, Kleve, Krefeld, Lemgo, Lünen, Minden, Münster, Neuenkirchen, Neuss, Oberhausen, Recklinghausen, Rheine, Rietberg, Schöppingen, Siegen, Solingen, Vlotho, Witten and Wuppertal. As can be seen, 'Ab in die Mitte!' is only partly city-marketing. What is new about it is that all concepts and activities are joint products of the political and economic partners. The prime goal is to make town and city centres much more attractive places to visit. Success is mainly expressed by higher visitor numbers of different target groups. Indeed, the survey carried out in the project showed that the initiative succeeded in this respect. If 40% of those interviewed came to the city for the events, we can conclude from it that these events held a strong attraction to visitors. Everyone who visited any of the events in one of the cities could perceive that the atmosphere in the city centre had improved substantially. A good atmosphere will influence sales in the short, medium and long term. The good 'mix of visitors', as has been shown, consisting of younger and older visitors, people interested in arts and culture or sports enthusiasts, is a way towards creating social balance in the city centre. This is one point that has a positive effect on city safety; urban development in general is another. A recent study has shown that the cities of this federal state, North Rhine-Westphalia, belong to the safest of the entire republic. Urban development and projects such as 'Ab in die Mitte!' have certainly contributed to this positive result. This new way of cooperation between the government of the federal state, the cities and the retail trade has led to alliances, which are important for all future activities of common interest. The will and ability of all those who feel responsible for the city centres to cooperate were put to the test and it passed. The public secret of a 'private public partnership' is the generation of synergy effects. Urban development activities will be much easier to be harmonised in the future - in the interests of all parties involved and not in the last place in the interest of our customers. To sum up, one can say that projects such as 'Ab in die Mitte!' certainly prove that many city centre problems can be managed by joint activities. With this pilot project we have pursued a profitable path. That is why the project initiators have announced that this joint innovative activity started in 1999 is to be continued in the year 2002.